Go from the initial idea to a production-deployed web app using Django 2.0. 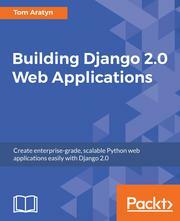 Build fully featured web projects in Django 2.0 through examples. If you have some basic knowledge of HTML, CSS, and Python and want to build fully-featured and secure applications using Django, then this book is for you. Get set to take your basic Django skills to the next level with this comprehensive guide! There's lots of information online about web apps but little reliable advice about how to go from concept to a production-deployed web app. Building Django Web Applications takes you step by step through building an app, working with the database, and deploying it into production.